We’ve already shared some tips for invoicing like a pro to help you get paid faster, strengthen your brand presence and make you the first person a client calls to get a job done. Here, we’re giving some advice on upping your invoice game even more. There are so many digital technologies at your disposal today that make life easier for both you and your customers. Here are a few you should add to your invoicing strategy. Discuss a retainer-based agreement that guarantees you a set number of hours and pounds each month and helps keep your client’s budget predictable. Highlight your payment options. Let your customers know you’ll take standing order, a cheque or an online credit card payment—whatever works best for them. Expedite your payment processing by making sure your invoice goes to the right person in the right department. Remember, the person who writes cheques in accounts payable is unlikely to be the point-person for your graphic design project. Another critical detail: does the person handling your invoice need a purchase order? Find out and make sure you include it on your invoice—or risk having your payment get snarled in some sticky red tape. Say thanks. Every time you receive your money, send a heartfelt, handwritten note to the accounts payable officer. When every part of your invoicing system is clear, streamlined, easy and efficient, you make the payment process as enjoyable as possible. And the bottom line is this: happy customers are more likely to be paying customers. 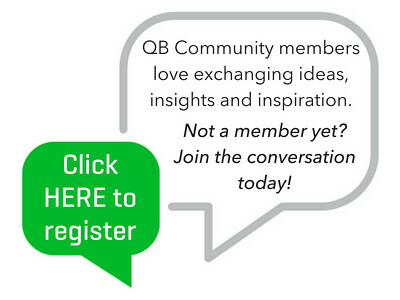 QB Community members, has your approach to invoicing evolved since you started your business? Please share what you’ve learned in the comments below... We would love to hear your experiences! It's so important to establish with your client the penalties of late payment before the first invoice is sent. It's much easier to have that conversation as a matter of process. In the event of late payment, "persistent and polite" as you may be, it can come off as more reprimand than a reminder. This is a super helpful post. What a great idea to incentivize *early* payments with a small discount for proactive clients. I also appreciate the reminder that my invoice is more than just a bill -- it's a representation of my whole brand. The more professional-looking, the better! What a great post! I love the idea of receiving gifts and the thank you notes! A great way to treat clients and encourage them to be on top of their money. Hi, @kentevents I saw that you were really happy with the customisable invoices on QB as they can help reflect your brand/business. I agree, customising invoices is a unique way of adding a personal touch and it means they stand out too. I was wondering @kentevents, has your approach to invoicing evolved since you started your business? & I would love to learn more about your business in the comments below! I would also recommend using 'Satago' which is debtor management system which you can programme to send out automatic reminders 7 days before invoice due date, the day before etc. You can taylor the emails to how you wish. It is free to use. Ensuring that you invoice template is customised within QuickBooks Online is such a simple one, but is very effective. By adding some personal touches such as a logo and colour can make you invoice stand out from the rest. Ensure that you have your terms clearly displayed on your invoice as well as the ways in which your customer can pay you (i.e. your BACS details or who they should make cheques payable too). Don't forget that QuickBooks has a reminder function as well (although you cannot currently automate this) which you can use to send out a friendly reminder to the customers who haven't paid approaching their invoice due date. They're amazing tips! Having customisable invoices is incredibly useful and the reminder function is so great. How would you set this reminder? Thank you so much for sharing your tips! Knowing these simple changes can make a huge difference when you're doing invoices. Customising your invoice with colours and images sounds fun too! Sorry I think you misunderstood. You can send reminders to clients alongside invoices within QuickBooks Online! Very Useful Tips !! Thanks for sharing. Welcome to the UK QB Community! It's great to have you here. I hope you're having a great start to the week. Do you have anything you could add to this list? Any tricks that have helped you?